Over the years, I have seen a lot of things. One of the more common issues I have been called in to resolve is that I call "enterprise/small business" misconfigurations. The availability of enterprise-class hardware and software has changed the technology landscape. Not surprisingly, their integration into the small business/home environment can lead to issues that can be difficult to diagnose. One of the most common issues is with IP addressing. Many home and small business routers, do multiple things for the network. Out of the box, they issue the IP addresses (DHCP - Dynamic Host Configuration Protocol), handle letting your computer know how to get to the websites you want to get to (DNS - Domain Name System), and other essential functions. Now, when you introduce a server to this environment, It will need additional support that the router alone cant do. The server, especially if you are going to use it to supply the username and passwords for several people, needs to control two essential functions, DHCP & DNS. By controlling these two functions of the network, it can make both maintaining and the future expansion of your system more manageable. Now if you chose to run a windows server, most likely you are running Active Directory (AD). But AD must control at least DNS on the domain. That is why windows also install that service when you set up AD. Now, If the machines that need to "talk" to the server are not using a windows server to get the information that it needs to navigate the web, they could have problems with it taking a long time to log into the machine, network speed and other small issues that only lead to frustration. The simplest way to fix these issues is to set up DHCP on the server and then turn off DHCP on the router. Sound simple, right!?!?! It can be, depending on what version of windows server you are running. Microsoft gives you a good "wizard" to set it up. The biggest thing the server needs to do it's job (and should already have) is a static IP address. TIP: You can open a command prompt quickly by using the windows key + the letter "R" and then type "CMD"
type "IPCONFIG" and then hit enter. You should see something like above. Now, you should have all the information that you need to setup DHCP on the server. 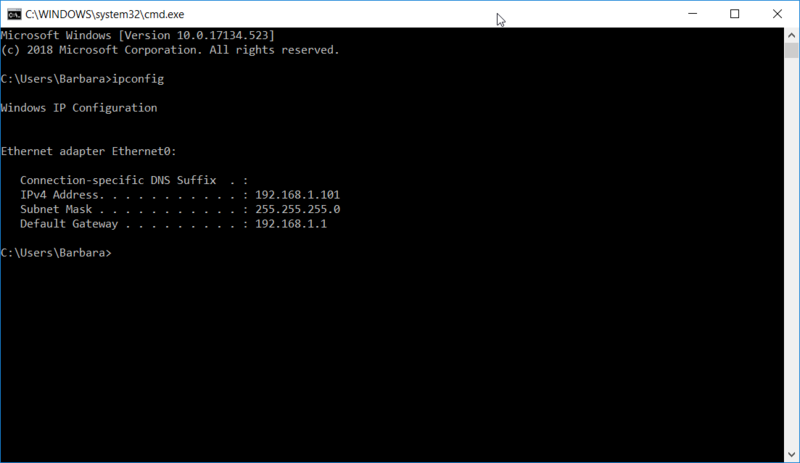 In the next part, i will go over how to set up DHCP on Server 2016.